Pharmacists across the country are working to educate patients about the rights, risks and responsibilities associated with prescription opioids. Katie Bass at San Joaquin Drug, a community pharmacy located in Planada, California, is one of those pharmacists and has found the Allied Against Opioid Abuse Pharmacy Toolkit to be helpful in facilitating these conversations. Bass is acutely aware of the national opioid epidemic and is working to reduce opioid misuse and abuse in her community. “Pharmacists are uniquely placed between healthcare providers and patients — and our patients tend to trust us when they need counsel and are not afraid to ask us questions about their medication,” Bass shares. As part of Bass’ routine for counseling every patient with a new opioid prescription, she passes out the AAOA Rights, Risks and Responsibilities resource. “The resource helps me stay on track and cover all the points I need to review in a short amount of time,” she says. In many situations when Bass speaks to patients, they are not aware of the potential dangers of prescription opioids, so the education is filling a much-needed gap in the healthcare space. “Patients do not always know what to ask when they are receiving their prescription from a healthcare provider, and there may be limited time in the office or hospital, so I can take those extra few minutes to really explain the prescription and make sure the patient is comfortable before leaving the pharmacy.” By providing patient-friendly resources that can be taken home, Bass feels confident that the education will stick with patients. Patients also appreciate learning how to safely dispose of their medication after use, and knowing that San Joaquin Pharmacy provides a MedSafe for collecting unused medication. In fact, the disposal site has been so popular that patients from around the Planada area dispose of their medication at the pharmacy. The AAOA Pharmacy Toolkit also includes a Prescriber Engagement Guide to help guide conversations between pharmacists and healthcare providers. Bass works to proactively educate prescribers by sending them the latest prescribing guidelines and resources to let them know how she can be a valuable member of the patient’s care team. She frequently monitors trends and alerts prescribers when rates of opioid prescriptions are higher than their peers. These conversations with healthcare providers have led to further education about alternative therapies and set up the pharmacist as an ally in treating patients. For more information on the pharmacy toolkit and to download resources, please visit www.AgainstOpioidAbuse.org/PharmacyToolkit. Katherine Bass is CEO and pharmacist in charge at San Joaquin Drug pharmacy. 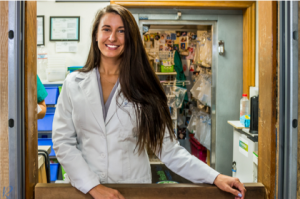 She graduated pharmacy school in 2014 from University of Hawaii at Hilo. She currently resides in Fresno with her husband, Jeffrey Meyer. She is an active member of California Pharmacists Association, National Community Pharmacists Association and several local Chambers of Commerce.